The Romance Dish: Witches Are Wonderful! Don't you just love book recommendations? I do! I still think I pick up my best reading via word of mouth. I've come across some of my favorite current books via recommendations on this site - so please don't be shy about suggesting things! Just off the top of my head, I can think of writers like Julia Spencer-Fleming and Molly O'Keefe who are now autobuys for me, thanks to the wise comments of the Romance Dish fans. 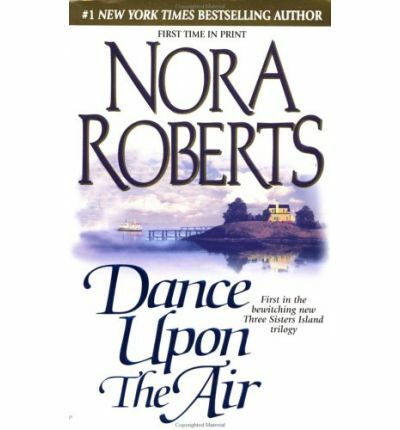 For a long time, my friend, Rachel Bailey, who writes for Desire, has raved about the Nora Roberts Three Sisters Island Trilogy. Mind you, I've equally raved about the Chesapeake Quartet and I think she's yet to pay me any attention, so until now we've both missed out on some great books! I imagine most of you have read these books so I'm speaking to the converted, but wow, they're great. I hadn't read Nora in a little while and I'd forgotten just how masterly she is at romantic tension and characterization and setting. You really feel like you're on this beautiful windswept island off the Massachusetts coast, smelling the sea and squeaking your way over the sand (hopefully to the cave - good things happen in the cave, LOL!). There's such beautiful texture in this writing. Not to mention the story features a great bookshop which I want in my hometown! I read all of these within the space of 36 hours. Recommendation enough! During the 17th century Salem Witch Hunts, three sisters, all witches and all representing an element, air, earth and fire, unite to create an island sanctuary off the coast. That's Three Sisters Island. As you read the books, you discover that all three sisters come to a sad end, ends reflected in their modern-day descendants who are the heroines of this series. The last surviving 17th century sister creates a spell that will keep the island safe from the forces of darkness for 300 years. At the start of the Three Sisters Island trilogy, that 300 years is coming to an end and each heroine must face and defeat her fears if she is to save the island from sinking into the sea. So high stakes right from the get-go! Book 1 in the series, DANCE UPON THE AIR, features battered wife on the run Nell Channing/Helen Remington. Nell, who represents the air element, has no idea that she's a witch so it's fun watching her come to terms with the woo-woo stuff that invades her life once she arrives on Three Sisters Island. Once there, she starts to heal. She finds a home and a place where she can exercise her talents as a cook (the meals in this will make you hungry, be warned!) and she also encounters gentle but strong local sheriff, Zack Todd. But can Nell accept love after all she's been through? And what happens when her violent husband discovers that she faked her death and she's still very much alive on the other side of America? This is a great introduction to the series. We meet most of the major characters - even if only by description. We fall in love with the gorgeous island setting. Watching Nell and Zack come together is touching and emotional and you'll cheer as Nell discovers her new powers (both personal and witchy!) and searches for the courage to stand up to the man who nearly destroyed her. 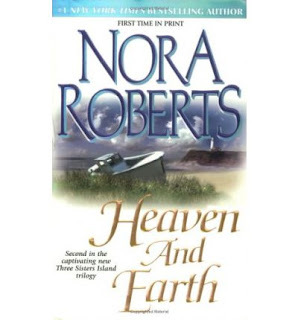 Book 2, HEAVEN AND EARTH, is actually my favorite of the three, partly because I can't resist a really good geek hero. Although MacAllister Booke is more like Indiana Jones than Brains from THUNDERBIRDS. Mac is a paranormal researcher who comes to the island and falls in love with prickly Ripley, Zack's sister and deputy sheriff. Ripley represents earth - not that she wants to, she's got good reason to fear the strength of her powers and so she's deep in denial when the book starts. Her denial doesn't just include repressing her abilities as a witch, but also her once-close friendship with the heroine of the third book, Mia Devlin, who represents fire. One of the really lovely things about this book is seeing calm, centered Mac cope with Ripley's volatility. I laughed out loud at a few of these scenes. They really are beautifully done. 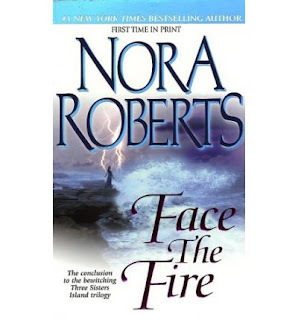 Book 3, FACE THE FIRE, brings the final confrontation with the evil that has stalked the witches since at least the 17th century. The heroine Mia knows that, as the direct descendant of the witch who conjured the protective spell in the first place, she's the island's last defense. But she needs to learn some lessons before she can defeat the darkness. One of these is that she's not a lone agent and she needs to work with the people who love her to have a hope of winning. Another is that she needs to come to terms with Sam Logan, the man she loved and lost in her late teens. This is basically a reunion story and I always enjoy a good one of those. Sam left Three Sisters as a young man and now he's back to reclaim Mia, the woman he's always loved. Needless to say, after ten years, this doesn't go smoothly! And the bad stuff encroaching on the island doesn't help. But Sam is an intrinsic part of the island and an intrinsic part of the cosmic plan to defeat the forces ranged against the witches. He's the water part of the equation so when he's reunited with Mia, all the elements join to save Three Sisters Island. But will they be strong enough? So have you read these books? Do you have a favorite? Are you a fan of the geeky hero? What's your favorite Nora Roberts book? I have to say, much as I loved these, I still think the Chesapeake Quartet just edged the Three Sisters Island books out as my absolute top. These are still my favourite Nora books, though the Circle of Seven trilogy and the Key trilogy come close - and I love all her series books too. My favourite of her big stand-alone books is Chasing Fire. Does Roarke from her JD Robb series count as a geeky hero ;)? Hi VR! There are very few Nora books that I haven't enjoyed but I do have favorites. Of her single-title books, I'm especially fond of the Chesapeake Quartet, the Born In trilogy and the Irish trilogy. And, of course, the MacGregors (mostly category books) have a very special place in my heart. Morning All! Anna sends her apologies for not being here today. She's at a writer's retreat and does not have internet access but she'll be checking in when she gets home and is looking forward to lots of recommendations! I read my first Nora Roberts book, All the Possibilities, the third Macgregor book, in 1985. I glommed her earlier books and have missed very few of her books since then. I'm with PJ on favorites--the Chesapeake Quartet, the Born in trilogy, and the Gallagher books in that order, although I have reread my second three favorite series--the Dream trilogy, the Key trilogy, and the Brides quartet--several times. Have you read the Brides quartet, Anna? Carter Maguire in the first book in that series (Vision in White) is one of her best geeky heroes IMO. I adore him. Among the non-series books, my top three favorites are Carnal Innocence, Montana Sky, and The Witness. Then there are the categories. I still have quite a number on my keeper shelves. Not surprisingly my favorites are series. Top three: the MacGregors, the Stanislaskis, and the MacKades. Despite all these Nora Roberts favorites, I'm not a Robb fan. I did read a couple at the urging of a friend who is a huge Robb fan, but they are just not my cup of tea. All the Possibilities was my first Nora book too, Janga. That's all it took to make me a fan. The Three Sisters Island Trilogy holds a special place in my heart because they were the first Nora's I read (at the urging of my sister). I was very much an historical girl until Nora. After I read that trilogy I not only read more and more Nora but branched out into other contemporary authors - Susan Elizabeth Phillips, Jennifer Crusie, Rachel Gibson, Robyn Carr, to name a few. So needless to say I feel as if I owe Nora. She did such a fabulous job of captivating me with her writing and removing my prejudice about contemporaries that she paved the way to so so many amazing reads for me. The Sisters Island trilogy was my first Nora Roberts too! I love all the titles mentioned as well but the Sisters will always be my favorites. That first book (or series) that introduces us to a favorite author always holds a special place in our reader's heart, doesn't it? You named one of my fav series her, The Chesapeake Quartet, but one of my all time fava was one of her very first series was the Dream Series, Daring to Dream, Holding the Dream, Finding the Dream, and next her Born series, Born in Fire, Born in Ice and Born in Shame... and then there was her Gallagher series.. I could go on and on and on about Nora's books.. I have Whiskey Beach on my bookshelf.. I like her stand alones too..
Anna, I love this series. I think it may have been Jeanne Adams who put me onto it. The paranormal elements work really well to add to the story, and you know I love geek heroes! I also have a weakness for "created" families, people who bond so closely that they're absolutely loyal, as we'd all like families to be. That's reflected in my list of favorites. Chasing Fire is probably my favorite of Nora's books. I also love the Chesapeake Quartet, the Sign of Seven trilogy (also paranormal but more heavily so and darker), and The Search. I have many others of hers that I love and will keep, but those are the top of the list. Thanks for adding your favorites, Nancy! Can you believe I just started reading Nora lol. I've only read 3 so far but I've enjoyed them. I kept putting it off because so many are connected or series that it does make it confusing and I like to have the series before I start. I've recently discovered Grace Burrowes and am enjoying her very much! Can you believe I just started reading Nora lol. The Sisters trilogy, the Garden trilogy and the Key trilogy are my favorite NR books. Face the Fire is my favorite of these books, but my very favorite NR books is Perfect Neighbor, which is a MacGregor category. I loved them both the Three Sisters and Chesapeake series. My favorite Nora Robert series is the Bridal ones. I just loved everything about them. Next would Hillsboro Inn series. I enjoyed reading all her series books.